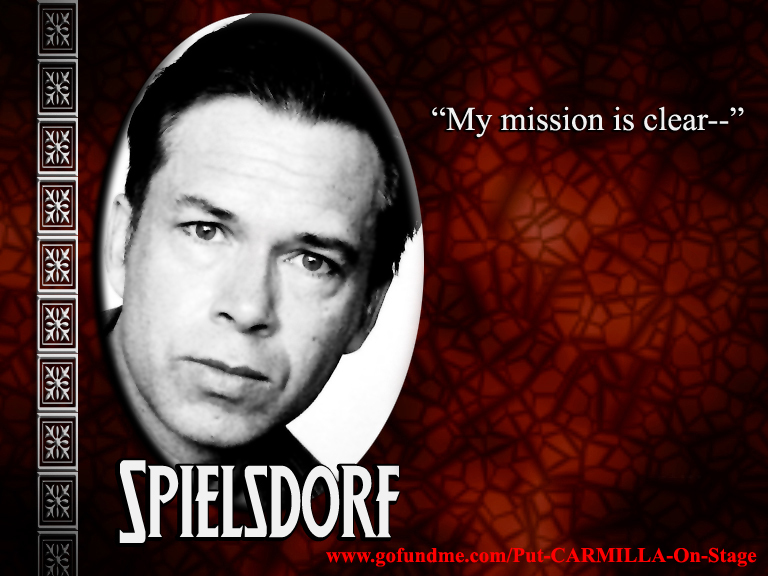 As Dracula has Professor Van Helsing, so Carmilla has her nemesis, Colonel Spielsdorf. Only in this story, the vampire hunter’s motivations prove very personal. Douglas was among the very first people cast, having nailed the role in the most recent reading of an earlier draft. First, tell me about yourself! Who is Douglas Eames? I’m a rather free-spirited big kid from New Orleans, Louisiana. I was always a bit of an outsider growing up: I was an only child and my parents divorced when I was young. I spent most of that time living with my mother, who moved around a lot, so I was always changing schools and having to adapt to new surroundings. I found a kind of a Walter Mitty escapism in my imagination — and acting, writing, and drawing were always ways I could channel that. After I got my BA in communications at Southeastern Louisiana University in the mid-80s, I headed out to LA, where I pursued a career in film and TV. I got my first break playing a recurring orderly on ABC’s General Hospital in late 1987, and that led to other jobs, including a fun supporting role in cult film director Andy Milligan’s final movie, Surgikill. Since then, I’ve done some voice-over projects, a lot of freelance writing, and appeared in various plays, minor TV and film roles, and commercials. And how did you come to end up cast in Carmilla? I’d just finished shooting Mabuse 2: Etiopomar, when I was contacted by our director, Ansel Faraj, who asked if I could participate in a table read in North Hollywood for this playwright he knew. 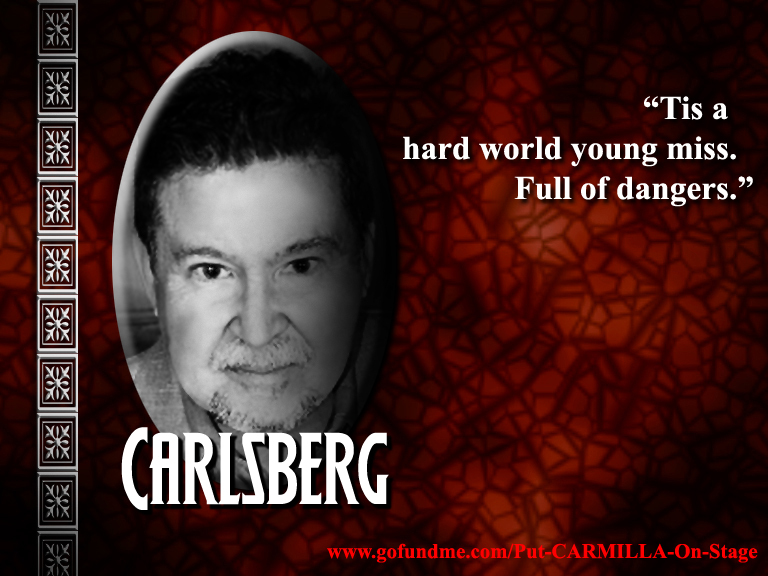 He said the part I’d be reading was based on the Peter Cushing role in The Vampire Lovers. I did a little googling and found it on youtube. I really enjoyed the part, and seeing as how I’d just finished working with several actors from the original Dark Shadows series on Mabuse, it seemed like vampires were a good theme for me! Had you read the story before or were you familiar with it? The name was vaguely familiar but the storyline didn’t ring a bell. So I watched The Vampire Lovers on youtube as Ansel suggested, and realized this was a film my mother had taken me to see at the Showtown Drive-In in Baton Rouge Louisiana when I was about 7 or 8! Your character, Spielsdorf, how do you see him? I see Spielsdorf as an extension of my own social ineptitude: he longs to be accepted by his friends, but has a great deal of difficulty keeping his cool and fitting in, given his conflicted nature. He feels a collection of contradictory emotions. On the one hand, he’s emotionally ravaged by the loss of his beloved niece to this creature of the underworld, yet on the other, he is a Nazi commander who participates in a system of sociopathic brutality every day. He’s in charge of a branch of military service related to the study of history and the supernatural, so given his background and his present emotional upheaval, the audience is left to wonder how much of this is his crazed imagination running wild, and how much of what he’s saying is really true. This is a very fun premise to play with, that unsure grey area between perception and reality! What do you think is the most surprising thing about him? The fact that this hardened commander, who oversees injustice on a daily basis, can at once feel so disturbed and torn apart by the death of one of his own. Is there a particular hope you nurture about your performance? I hope to strike a balance between Spielsdorf’s ruthlessness and his humanity, to keep the audience guessing about what’s really going on. For this adaptation, Spielsdorf is a Nazi. An SS officer even! Is there any particular challenge in approaching that aspect of his character? I think the biggest challenge is to find the humanity, the part inside that wants to be loved and accepted, that part that hits a wall and implodes with him…to bring that out, along with this rage inside him — and, of course, to avoid playing him as Colonel Klink in Hogan’s Heroes! Finally, is there a question you wished I’d asked? If so, what would be the answer? Your questions seemed to cover all the basics! Just that I’m very happy to be a part of the production and having the opportunity to work with such a gifted cast!